I forgot to set my alarm because I fell asleep while I was watching "The Skin I Live In." And when I woke up, I accidentally fell asleep again. Oh that post Christmas weather just makes you want to sleep for the whole day. So when I finally got up, I rushed to take a bath and I really feel like putting makeup on. I just don't want to skip makeup for today, and so I did. Just a quick swipe of this and that and I'm done. I guess that sufficed. When I got to work, I was six minutes late so it's not really that bad (thank you, 15 minutes grace period); and then after our daily morning devotion, I went straight to my cubicle and started checking my emails. After a few minutes, my boss called for me and while I was approaching her she had this smile painted on her face. Then, she showed me my new appointment. I am now, officially, promoted! She already told me about this during the latter part of the year, but of course, celebration only commences once I sign my new appointment, right? And I'm glad to be wearing makeup to receive this awesome news. I started off with pouring some of the Maybelline Super Stay 24HR Makeup in Natural Beige at the back of my hand and applied it all over my face using my ring finger and then blended it still with the fingers. Afterwards, I used the Cover Girl Aqua Smooth Makeup in Creamy Natural on the under eye area which also worked as a highlighter of some sort since it's a shade lighter than I am. 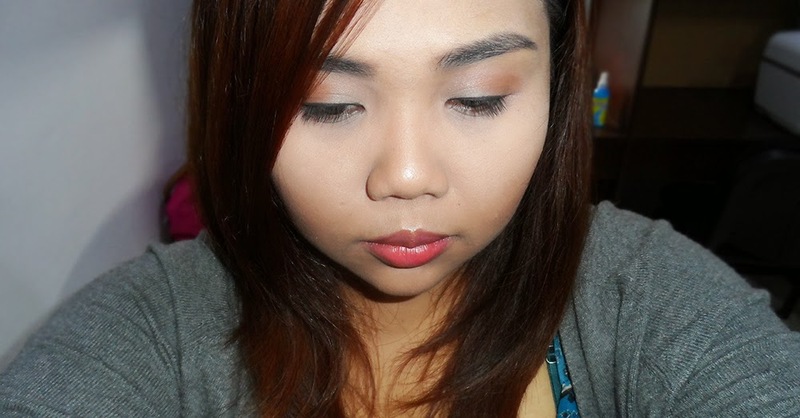 After blending it well, I topped everything with the SanSan Pressed Powder in Shade 01. Then, I used the SanSan Champagne Temptation Collection Blush Mosaic in RSVPink just under my cheekbone to give that wanted contoured jaw. 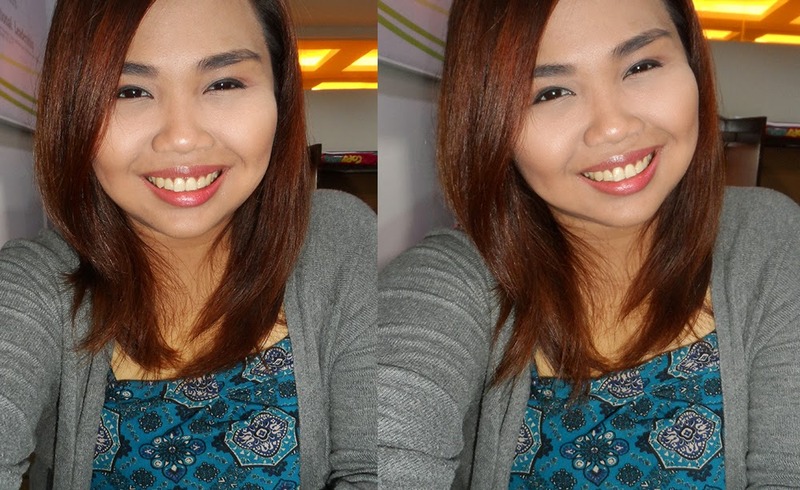 For my eyes, I used the Happy Skin Eye Love View Pencil & Marker Eyebrow Duo in Chic Brown first to fill in my brows. Then, I used the SanSan CYO Eyeshadow in Soft Sun Glow all over my lids, the SanSan CYO Eyeshadow in Pink Opal on my crease and blended it with the SanSan CYO Eyeshadow in Warm Copper Fire to make it more noticeable. After that, I used the Maybelline Master Liner in Black on my upper lid and on just a quarter of my outer waterline. Then, I just applied the ELF Waterproof Lengthening & Volumizing Mascara in Black on my lashes without curling it just to see if it will do well on its own; and it turned out to be quite good. For my lips, I just applied the Crazy Rumors Lip Balm in Peppermint Twist all over it and topped it with the Snoe Rouge Deluxe Lipstick in Precious Pout. Good things happen to those who wait and persevere; or at least that's how it worked for me. I have made sacrifices and, although, I know that I chose and did the right thing questions such as: "how will I benefit from it?" popped in my mind. But, again, sometimes we must make sacrifices for the greater good because it is just the right thing. Sometimes, we need to be less selfish and in the end we will realize that life is so much more worth living without any of that guilt feeling inside of your chest. I guess I just reaped what I sow; and this is what I truly deserve. That's so great to hear! Congratulations on your promotion! That must have been a blast. And yes; you deserved it!